From The Pleasures of Cooking for One, pp. 58-59. 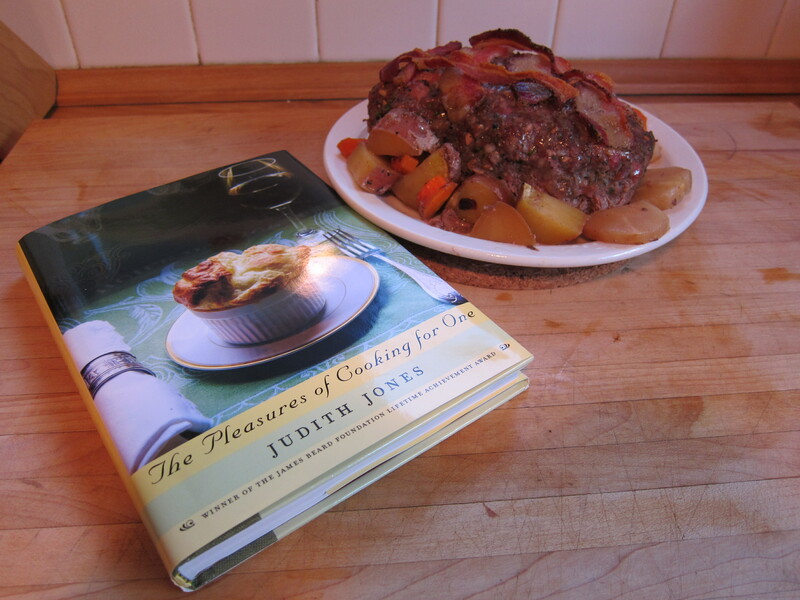 Judith Jones is my kind of cookbook writer: a sensible, good writer who takes seriously those home cooks, like herself, who live alone. Her recipes do not equate cooking for one with simple preparation. That’s what I like about her, but that’s also what might put some people off. Jones assumes that cooks who live alone are as apt to plan their meals ahead as are cooks with partners or families. The recipes in this slim volume suit the kind of cook who anticipates her meals with pleasure a day or so in advance. I try to eat meat no more than twice a week. In this case, as you may notice when you look closely at the photo, I doubled the recipe so that I could have three even four meals. I froze half of it, but will be sure to eat it within a month. Shadowcook: I can no longer bring myself to buy veal. Instead, I divide the meat evenly between beef and pork. Shadowcook: No soaking needed more or less true, but I would increase the dried porcini not quite by half and shred or crumble into small pieces. Shadowcook: I used fresh herbs. Herbes de Provence strikes me as very old-fashioned, because I rarely use dried herbs. But maybe there’s reason. Shadowcook: Try the white wine. The night before you’re planning to have a meatloaf dinner, put the meats in a bowl. Smash the garlic cloves, peel and chop them fine, then, with the flat of your chef’s knife, mash them into a paste with 1/4 teaspoon of the salt. Chop the shallots and parsley, and crumble the porcini. Add all these seasonings to the meats, along with the herbes de Provance, the wine, several grindings of your pepper mill, and the remaining salt. Mix thoroughly with your hands, squishing the meat with your fingers. When thoroughly mixed, cover the bowl with plastic wrap and let macerate for 24 hours in the refrigerator. Shadowcook: Just do as she says. However, the smell of meat and wine clung to my hands for hours no matter how hard I scrubbed them. Rubber gloves? The next day, remove the meat from the fridge and pull off a tiny piece. Cook it quickly in a small skillet, then taste it to see if it needs more seasoning. If so, add whatever is needed. Shadowcook: Great idea. I didn’t do it, but it’s a great idea. This is the sort of direction that shows how Jones assumes the person cooking for herself takes food preparation seriously. Form the meat into a small loaf. Break the bay leaf into three pieces, and arrange them on top of the loaf; then lay the bacon strip, also cut in thirds, on top. Transfer the loaf to a medium baking pan. Rub a little olive oil and salt over the vegetables you want as an accompaniment, and distribute them around the meatloaf. Bake in a preheated 350 oven for 45-50 minutes, turning the vegetables once. Everything is done when the meat looks lightly browned, the bacon a bit crisp, and the veggies tender (the internal temperature of the loaf should be about 150 degrees). Let rest for at least 5 minutes, then cut three or more slices, and arrange on a warm plate, with the vegetable surrounding the meat and the juice poured over. Shadowcook: Another example of how essential a meat thermometer is to successful cooking. Second round: Leftover meatloaf is good cold — but not overly chilled. Eaten with a dab of Dijon mustard, little cornichons, and a glass of red wine, it will taste almost like a French country paté.